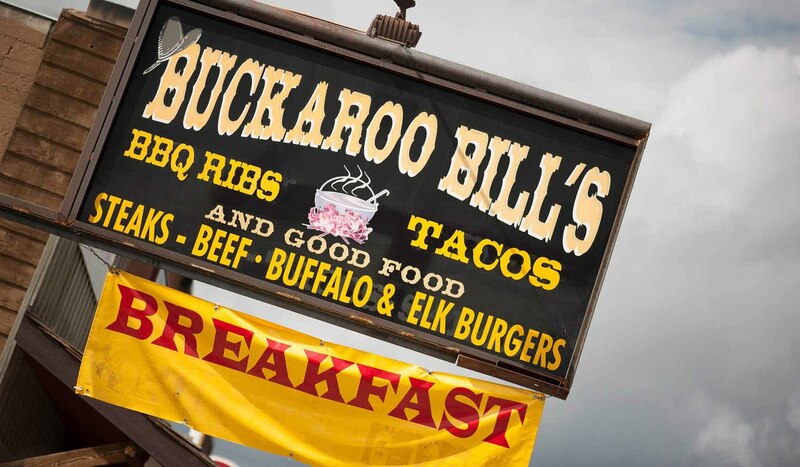 Buckaroo Bill BBQ Grill serving their award winning baby back ribs, BBQ pulled pork, chicken, beef and famous "Wolverine Burger" - (from 1/2 pound to 1 pound). For those who dare, try our "Montana Road Kill". For you steak eaters there are American steaks, buffalo and elk steaks or Crazy Horse grilled sausage, onions and green peppers. Or choose from, Wagon Wheel Pizza or El Gringo tacos. If you are a gambling man, we challenge you to our enormous banana split; if you can eat it all (time limit) it's free. Malts, shakes and 26 flavors of ice cream. Leave room for a piece of pie! Dine in a covered wagon, also seating inside and outside.